Busting Driving Myths: Does Your Insurance Always Have Your Back? 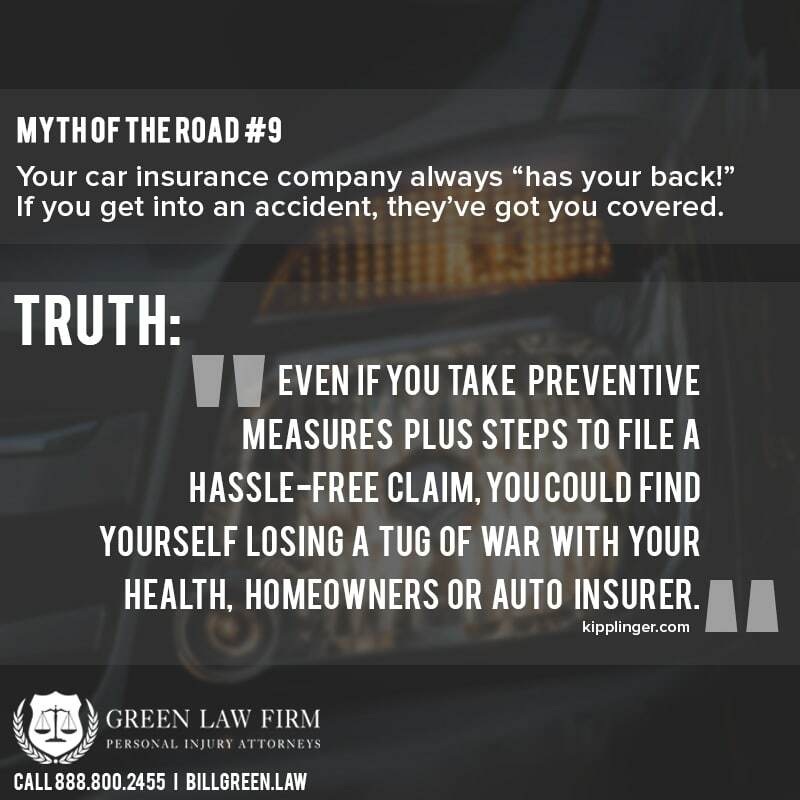 The Myth: Like a good neighbor… your insurance company is always on your side, no? At least that is what we think when we sign our auto policy! We shop around for the best rate we can, apply and then sign our (literal) life away to a company we assume will protect our interests if we ever get into a major car accident. We have (what feels to us like a reasonable) expectation that insurance companies will have our back, defend us and pay us fairly as we need it. They… pressure you to settle fast. When an insurance company encourages you to “get on with your life” and move forward, they are urging you to accept a lower payout than you might normally be able to get. To put it bluntly? If this happens, you deserve more compensation. The more educated you are, the more you may look into what you are entitled to; in many instances, an insurance company will try to get you to settle quickly to eliminate the chance for you to do your research and ask for more! They… delay in paying out all the time. While it’s often in an insurance company’s interest to get you to settle your claim early, fast and for less value than it’s worth, they won’t always do it. Sometimes, they will do the exact opposite by stretching your claim out to avoid paying you at all or waiting as long as possible. It all boils down to the business model. An insurance company gets more benefit from holding onto your money as long as possible because they don’t actually trade you physical goods in exchange for your money. They are betting you won’t need a payout more than your annual premium. They hold money, increase revenue, and invest policyholder premiums. The long story short, it’s their business model. And that model isn’t looking out for you when push comes to shove! They… sometimes don’t cover enough. Medical bills are expensive. While a few thousand dollars feels like a lot of money when it comes from your pocket… to a hospital, it’s nothing. You’d be SHOCKED at how high the costs tally up after a major accident has occurred leaving you with serious injuries! Experts say that the average visit to the ER can be upwards of $2,000, which can be 40 percent higher than what an everyday person pays for rent in a single month! The state of South Carolina requires you to have a minimum of $25,000 for bodily injury or death per person, $50,000 total for bodily injury or death per accident, and $25,000 total for property damage. A large-scale accident in a car with multiple people can easily take you beyond the limits of your insurance plan… and if that happens, they are simply done paying out. If You or a Loved One Has Been in an Auto Accident, Your Best Advocate Is a Personal Injury Lawyer. While an insurance company does not work for your best interest, an experience car accident lawyer is rooted in your success. Especially for a firm that is compensated based solely on your payout! The experienced professionals at Green Law Firm will review your case with the care and attention it deserves at no cost to you. We handle the burden and stress of slow-moving insurance companies for you, and will voraciously pursue justice on your behalf!